After watching “Vegucated“, a documentary that follows three people as they are challenged to become vegan for six weeks, I have become motivated to eat less meat and use fewer animal products. I decided that rather than going completely vegan, I will eat vegan when I can, and explore different recipes that are vegan and/or vegetarian. I started with mini polenta pizzas, which is a vegetarian recipe. This recipe was based on the “Pizza Polenta” recipe from ‘Pas Besoin d’Être Végé pour Aimer ce Livre”, which was given to me by my boyfriend Tom, who promised he would speak french with me every time we made a recipe from this book. The recipes are by 35 famous chefs from around Quebec and this recipe is by Gilles Herzog. It includes a recipe for the polenta dough, but there was no polenta flour to be found at the grocery store I was in, so I had to settle for a pre-made polenta dough (I know, gasp!). This is just one of the fun parts of cooking – sometimes you have to improvise when you can’t find what you are looking for. I started by making the tomato compote by placing 8 tomatoes (cut into quarters and seeded), 1 tbsp brown sugar, 2 tbsp olive oil, and salt in a baking dish and covered it with aluminum foil. I let it bake in the oven for 2 hours on 300 degrees Fahrenheit . Bring vegetable stock to a boil and incorporate the goat cheese, olive oil, salt, and pepper. Whisk in the polenta flour and let cook for ten minutes, making sure to stir it often. Place the dough in a dish covered with parchment paper and let it harden in the fridge. Form it into a cylinder so that you can cut it like a loaf of bread into mini pizzas. Next, I made the Black Olive Coulis. 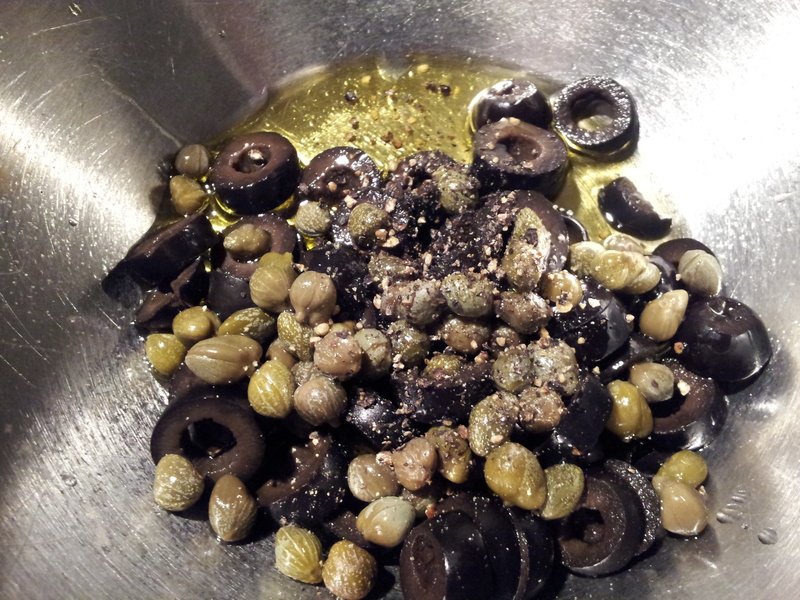 I placed 1/2 cup pitted black olives, 1 tbsp capers, 3 tbsp olive oil, and pepper in a blender or food processor and blended until smooth. 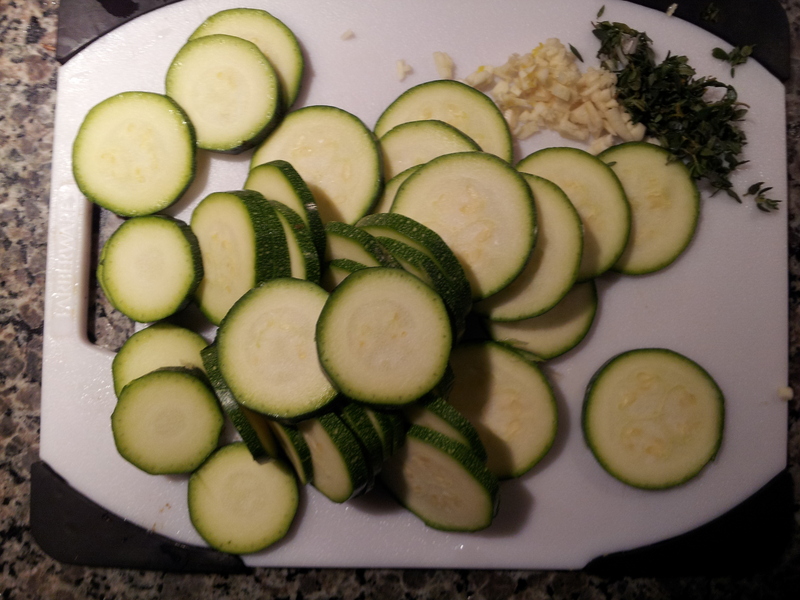 Next, I sautéed 2 zucchinis, 1 clove of garlic, 1/2 tbs fresh thyme, 2 tbsp olive oil, and salt and pepper to taste, for about 3 minutes. 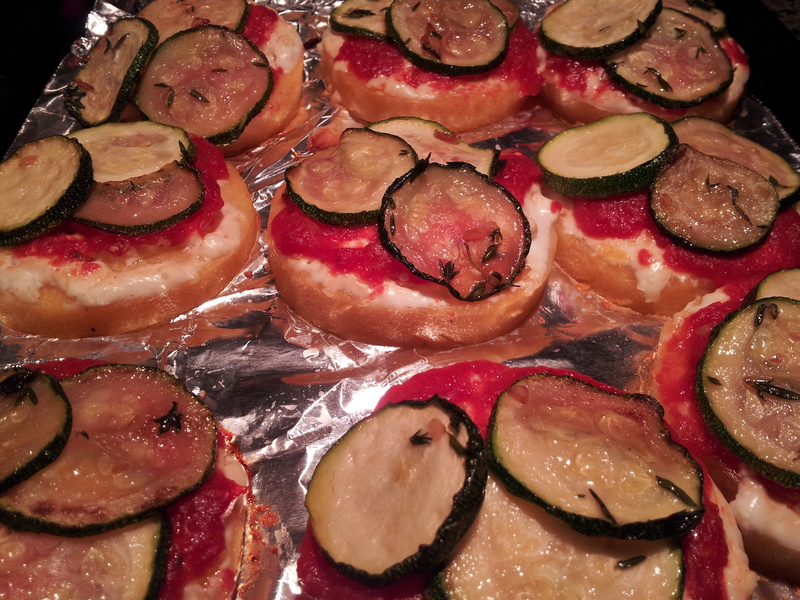 To assemble the pizza, cut the polenta dough into disks and layer the tomato compote, followed by the zucchinis on top. I started with a layer of goat cheese because I was not able to put it in the dough. Bake on a cookie sheet covered with aluminum foil for 15 minutes at 300 degrees Fahrenheit. Serve the black olive coulis on top of the pizza, and toss some of the olive coulis with 3 cups of arugula. With a mouthful of pizza, olive coulis, and arugula, it was pretty tasty!